Want some company while watching the Cubs (possibly) take the NLDS series against the despised Cardinals? Crew is opening early for the occasion. "Nothing beats afternoon baseball at Wrigley Field in October! Crew will open at 3pm today so you won't miss any of the action in Game 4 of the Cubs/Cards postseason battle. We'll have the game on our 24 HDTVs, and with sound. Happy Hour goes from 4-7pm. 1/2 off our featured Crew cocktails. Oh, and it's Taco Tuesday!!! So Dollar Tacos. Beergarita Pints are $4.75. Could this day get any better? Only with a Cubs clinching win." 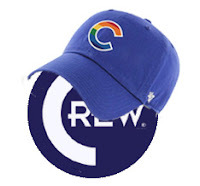 Have we forgiven the new ownership of Crew for supporting Crawford in the aldermanic election? Old ownership was great. Even wrote a wonderful letter praising Cappleman when they clearly didn't need to........after all they were the old ownership. I just looked though Crew does have an extensive alcohol list. Hmmmm. Nope, if I were inclined to watch the game in a bar it would be Fat Cat or Drink and Ink next to the tattoo emporium. By the way there is an alternative meaning for the word "tattoo". Belch.